Before we start her bio, we want to pause so you can appreciate everything about Kodie’s underbite. Pretty amazing, right? This girl is more than just her grin, though--she’s friendly, loves meeting new people, and is an absolute pleasure to be around! Kodie knows sit, shake, and high five, and might even have more special skills hiding up her sleeve that we haven’t discovered yet. She’s a great mix of sweet and gentle while still being adventurous and fun. Whether you want to go explore the park or stay home and dole out head scratches, she’ll be on board. Kodie did great in Dogs Playing For Life playgroups at the East Valley shelter, and we think she’d enjoy living in a home with or without other dogs. From what we’ve seen, we also think with a slow, proper introduction, Kodie might be able to live with cats! 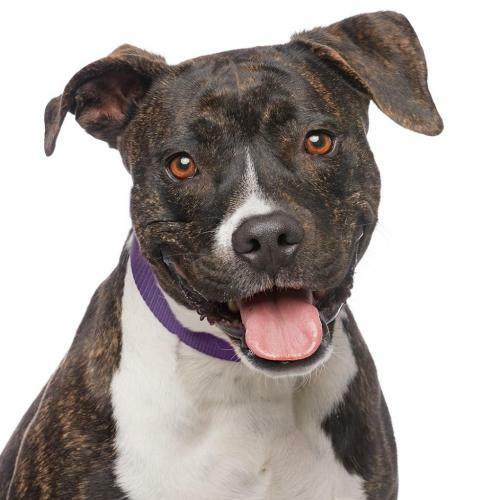 About 3 1/2 years old and 50 pounds, Kodie is crate-trained, house-trained, micro-chipped, up to date on routine vaccinations and working on her basic commands.